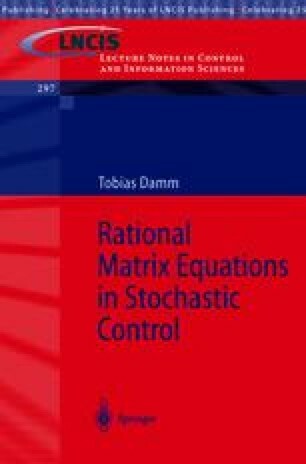 In the present chapter, we introduce linear stochastic control systems and the corresponding notions of stability, stabilizability and detectability. In the first part of this chapter our aim is to make the model of stochastic linear systems plausible and to give a heuristic derivation of stability criteria in terms of generalized Lyapunov equations. To this end, we have to take a look at the construction of the Itô integral and Itô’s formula. But – to avoid misunderstandings – it should be stressed that we do not aim at a profound derivation of these concepts. We only wish to motivate them in the context of robust control theory. For the exact arguments, we refer to the standard textbooks named in the introduction (in particular [6, 141, 142, 80, 125, 134, 156]). In the second part, basically starting with Example 1.5.8, we develop some more original ideas, which on the one hand aim at a justification of the given model in robustness analysis, and on the other hand yield a direct approach to the generalized algebraic Riccati equation, which constitutes the main topic of this work. Finally, we present a number of examples from the literature, some of which will be discussed on a numerical level in the last chapter.